Congratulations Stuey on your first blog. It's good to get your written take on cycling life in Europe at a favorite time of year for the World's (sports) cycling community. Sounds like you've had a fantastic week Stuey. Nurberg! Lucky #$*&!!! No Respect in the Peleton anymore? Really? Is it so different to 15 years ago? 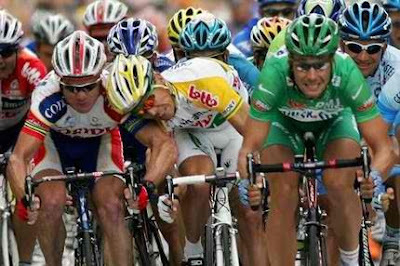 Maybe more money in the system equates to more pressure to perform but I'd suggest the Peleton still has it's Gentlemen and not-so Gentlemen, as it did back in the day. Cav and Petu have shown how to reflect on these ( almost unavoidable) dangerous events; still mates. Thanks for sharing Stuart, very interesting read! Welcome to the digital age of blogging. Love that the first post mentions Sagan should have been left in the game. Couldn't agree more... and not just because he has better hair than me!! Lovely of you to share you family memories, always lovely to catch a glimpse of the inside world of those we watch. Travel safe and keep reporting! Good to see you back on the roads in Europe Stuey. U heading to the south east as well?